In 1881, Charles Darwin hailed the importance of earthworms. Now there will be a survey of these creatures in Darwin's home country. The survey, led by the Natural History Museum, aims to map out which species of earthworms are present in various parts of the country and whether their habitat is under threat from pollution. The US $ 800,000-project will focus on 13 of the 28 species of earthworms living in England. Paul Eggleton, who heads the soil unit at Natural History Museum, said: "We are interested in the 13 most common ones because they improve soil fertility." The project will produce a field guide for volunteers to help them identify the type of worms they find. 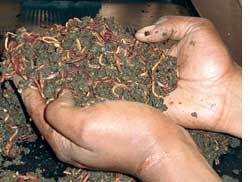 People can then feed the data to a website, which will contribute towards an interactive earthworm map. Eggleton said the survey should indicate soil health as worms are affected by pollution.